New "Be Inspired" brand for pork is unlikely to completely replace "the Other White Meat"
The federal government's promotion program for pork this month launched a new slogan for pork advertisements, "Be Inspired." The new slogan largely -- but not entirely -- replaces the previous slogan, "Pork. The Other White Meat." The Other White Meat" has another slogan. The National Pork Board on Friday replaced the decades-old ad campaign with a new message: "Pork: Be Inspired." Board officials said after nearly 25 years, it was time to move on from the old message that compared pork to chicken and instead try to increase sales by focusing on the estimated 82 million Americans who already eat pork. Both the old and new advertisements are funded by the National Pork Board, which is a "checkoff" program established by Congress in 1985 to support pork research and promotion. The board's $60 million annual budget is collected using federal taxation authority through a mandatory assessment on pork producers. [Update: Following two sentences have been revised in response to the first comment.] The board provides millions of dollars each year under subcontracts to the National Pork Producers Council, the industry's largest private-sector trade association. The USDA Office of the Inspector General (.pdf) wrote in 1999 that the National Pork Board "needs to improve accountability for the funds and regain control over the National Pork Producers Association's (NPPC) influence on the Board's business," which led to increased efforts in the 2000s to maintain an arm's length relationship between the two entities. 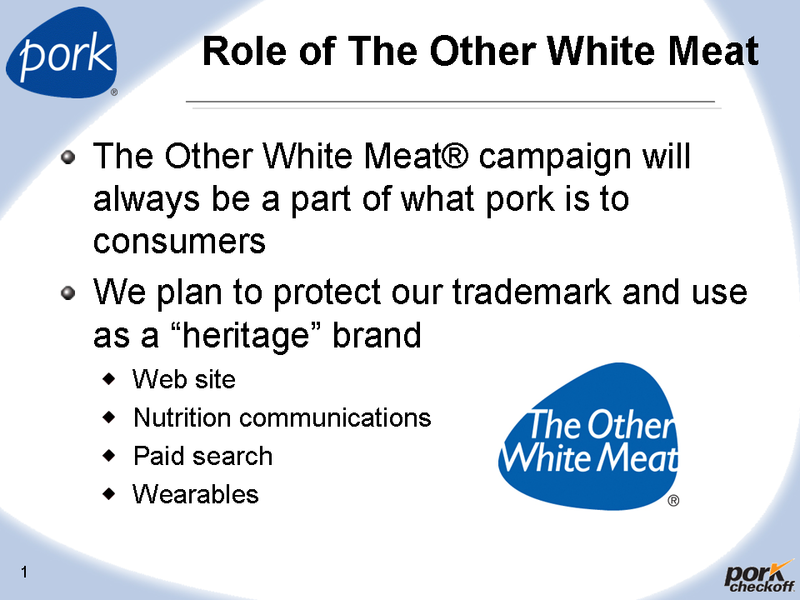 It is easy to see why the National Pork Board might have been dissatisfied with the 20-year-old Other White Meat slogan. During the years the slogan was used, chicken (broiler) consumption soared while pork consumption stagnated, even though there is no federal checkoff program for chicken as there is for pork and beef. 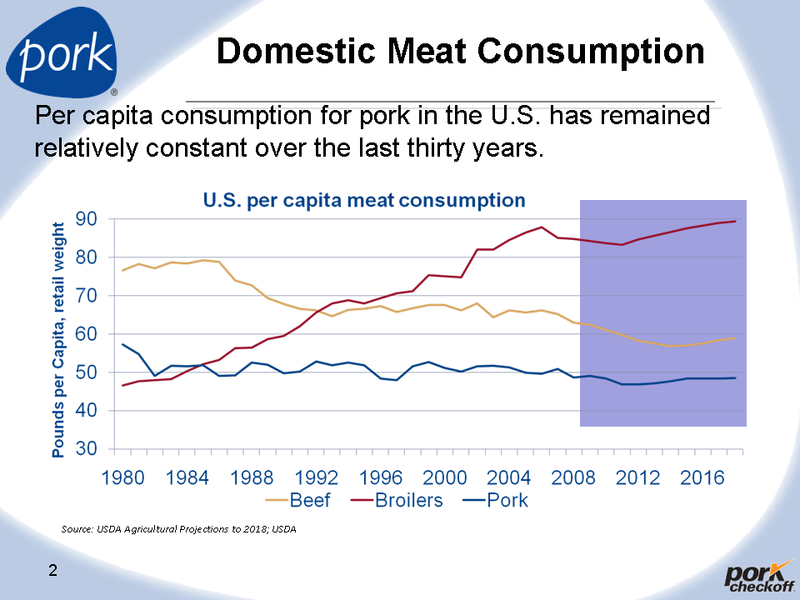 These trends were highlighted in an analysis prepared by the National Pork Board to justify the new campaign, which was approved by USDA's Agricultural Marketing Service in December, 2010. 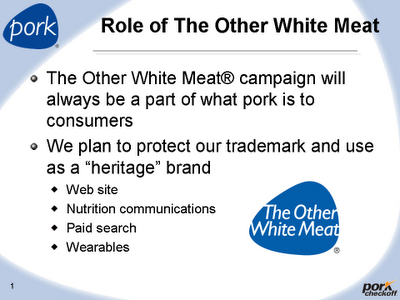 The analysis pointed out that the old Other White Meat brand was targeted at light users of pork. This audience was not enough to achieve the remarkably ambitious objective in the National Pork Board's new strategic plan: "a 10 percent increase in real per capita domestic consumer expenditures for pork." For such a sharp increase in pork demand, the new campaign will have to promote major increases in consumption by a target audience that is more heavily into pork. 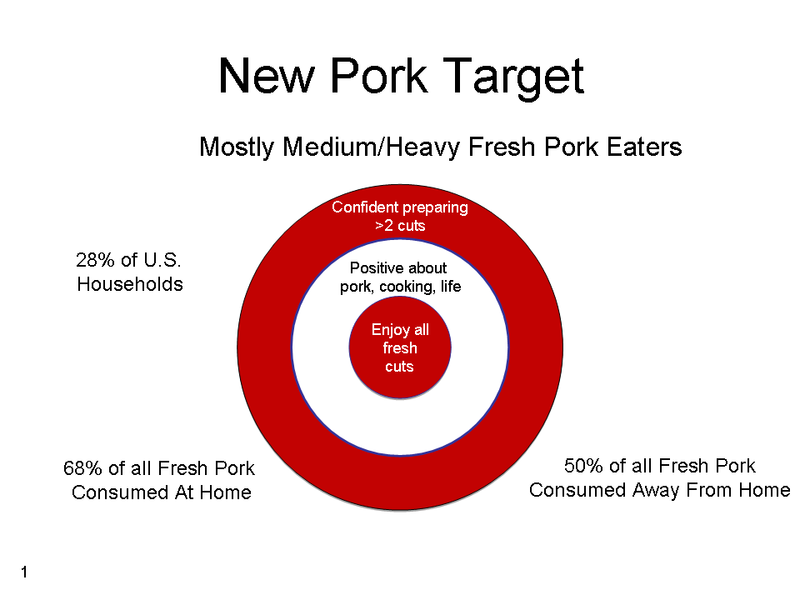 The new target audience is described in the National Pork Board analysis as "the flavor-seeking creative," people who enjoy cooking and "love a good meal -- with various proteins at the center, plus delicious sides." 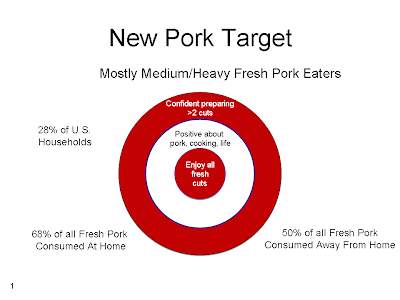 The target group is "aware of fat and sodium, but doesn’t let that stop them from enjoying pork." Despite what news reports implied, the documents from the National Pork Board say that the program is not abandoning the Other White Meat brand. You can still see the old brand way down in the bottom right corner of the pork board's website, described as a "Our Heritage Brand." It would have been awkward for the checkoff program to abandon the old brand entirely, given that the National Pork Board committed to using $60 million in farmers' checkoff payments to buy the rights to use the Other White Meat slogan from the National Pork Producers Council less than five years ago. At the time of this sale, I asked questions about the appraisal that was used to determine this sum, but neither USDA nor the National Pork Board would release the information. The documents I received under a Freedom of Information Act request were blacked out to remove the most important information. The information about the appraisal that was visible in the documents justified the $60 million estimate on the grounds that, without this purchase, the National Pork Board would have to invest in developing a new slogan from scratch. The reason now seems especially dubious, as the board invests in the launch of the new "Be Inspired" slogan. In 2006, USDA said the $60 million payment to the National Pork Producers Council would be made in intallments of $3 million per year for 20 years. It might be politic for the pork checkoff program to retain that "heritage brand" in the lower right-hand corner for many years to come. The sixth FamilyFarmed Expo will take place in Chicago March 17-19, with programming for farmers, local food businesses, restaurants, and policy advocates. There will be a conference March 17 on farm financing issues, and a Chicago Food Policy Summit March 18. It all started when Washington Post columnist Ezra Klein closed a column about the economics of cities with an offhand comment suggesting an end to the "raft of subsidies we devote to sustaining rural living." This column led to a fascinating debate between Klein and Agriculture Secretary Tom Vilsack, who said he took Klein's column "as a slam on rural America." In this debate, both participants made some rhetorical errors. Vilsack focused too much on the moral superiority of rural Americans and probably should have engaged Klein's specific concerns about subsidies more frankly. Klein conflated agricultural subsidies with broader rural subsidies, giving too little attention to the fact that most rural residents work in industries other than agriculture and get no benefit from agricultural subsidies. If by “rural subsidies” Klein means farm commodity subsidies, that should be isolated and taken head on. Klein is right to question and challenge the current structure of farm commodity subsidies. Current farm programs provide unlimited benefit to the largest farm operators. It cannot be said, however, that these subsidies are devoted to sustaining rural life. In fact, the system is literally undermining the economic and social foundation of rural communities. The subsidies accrue to only a small portion of the rural population. A 2007 report from the Center for Rural Affairs, Over Subsidizing and Under Investing, shows how badly skewed USDA investment is toward very large farm operators and away from investing in programs that build a future for all of rural America. The report found that the USDA spent nearly twice as much to subsidize just the 20 largest farms in each of 13 leading farm states examined as it invested in rural-development programs to create economic opportunity for the three million people living in 1,400 towns in the 20 most-struggling rural counties in the same 13 states. Current policy encourages big farms to get even bigger. Fewer farmers means fewer people in rural America. As farms consolidate, the population in the countryside declines. As the farm population declines, small towns also decline as less farmers need supplies and services. Rather than sustaining rural life, the current farm commodity system subsidies the decline of rural life. All other USDA rural development programs combined (rural broadband, rural small business, value added market development, etc.) account for a mere a fraction of one percent of all USDA spending. Although USDA is frequently described as being in the pocket of the meat and dairy industries, the new Dietary Guidelines for Americans, 2010, include a highly favorable discussion of plant-based and vegetarian diets. The new edition has a chapter on eating patterns, focusing on real foods and not just nutrients. This chapter on eating patterns provides a nice counterpoint to the reductionism -- what Michael Pollan calls "nutritionism" -- of scientific discussion of diet and health. Some of the guidelines' healthy eating patterns include meat, while others do not. For example, the USDA Food Patterns and the DASH diet each include moderate amounts of meat and plenty of lowfat dairy. At the same time, the guidelines explain clearly that meat is not essential, and near-vegetarian and vegetarian diets are adequate and even "have been associated with improved health outcomes." The new guidelines have adapted to many of the scientific criticisms of earlier editions. For example, Harvard scientist Walter Willett has long argued that replacing saturated fats with unsaturated fats saves lives, and that refined grains and simple carbohydrates are no healthier than unsaturated fats. The new Dietary Guidelines seem to me in complete agreement. However, not everybody likes the new guidelines. The most vociferous low-carb advocates say it is wrong to encourage reduction of saturated fats. Just this week on the Civil Eats blog, which I usually like, Kristin Wartman tore into the conventional wisdom on saturated fats: "The notion that saturated fats are detrimental to our health is deeply embedded in our Zeitgeist—but shockingly, the opposite just might be true." I generally agree with the way low-carb advocates criticize sugar and simple carbohydrates, but this corollary view of saturated fats worries me. Wartman's view seems threatening to the guidelines' favorable perspective on near-vegetarian and vegetarian diets, which are typically lower in saturated fats. Because the saturated fat corollary to the low-carb criticism of the Dietary Guidelines is widely believed, I need to spend a couple more paragraphs on why a low-saturated-fat diet might be okay for your health. First, there is the scientific evidence that lowering saturated fat reduces risk of heart disease. If you are primed to disbelieve any reductionist arguments, you can ignore this paragraph. But what strikes me as a lay reader of the scientific literature is how systematic and transparent the Dietary Guidelines' evidence reviews now are. For saturated fats, you can see exactly what protocol was used to select studies for review, and what criteria were used to evaluate them. You can confirm that the external Dietary Guidelines Advisory Committee report correctly reflected the evidence review, and that the actual Dietary Guidelines correctly reflected the Advisory Committee report. If you read any of the main low-carb advocates, such as Gary Taubes, see if you can discern in a similar way what his or her implicit protocol was for selecting studies to consider. If you find fault with the Dietary Guidelines' evidence review, please send a link in the comments to any systematic and transparent evidence review that you find superior. Second, there are the foods themselves that contain saturated fats. Part of the concern about "nutritionism" is that USDA lacks the courage to criticize specific foods. The guidelines may criticize saturated fats, but they won't mention specific foods, the critics say. I have my own slightly gentler expectation for the federal government's frankness in reporting. If the guidelines use scientific jargon for a food component such as "saturated fats," I think they should have the gumption to say what foods typically contain that component. This is exactly what the new edition does very well. 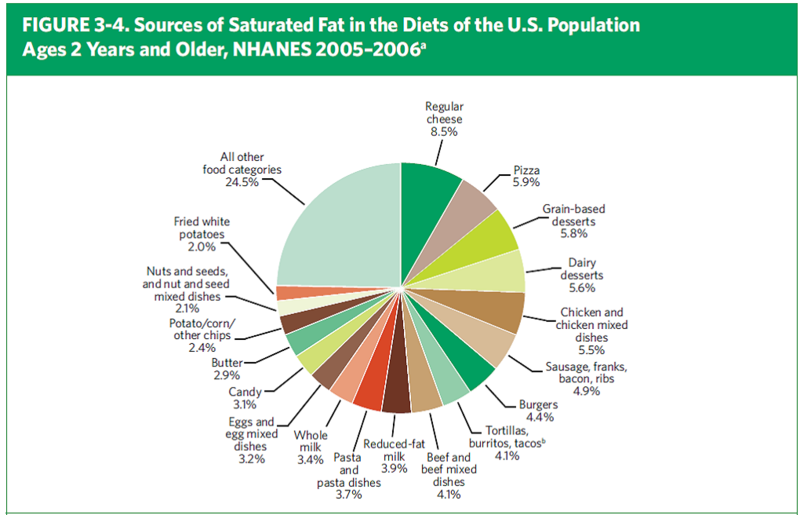 Here is the new report's pie chart to accompany the discussion of saturated fat (click if needed for a bigger image). So, the main implication of the Dietary Guidelines' continued criticism of saturated fat is to recommend reducing some combination of: regular cheese, pizza, grain-based desserts, dairy desserts, chicken and mixed dishes, sausage, franks, bacon, ribs, burgers, and so forth. As long as we all agree that occasional treats in reasonable portions are harmless, this advice sounds just fine to me. I don't see why anybody would complain about the Dietary Guidelines' advice about saturated fat. As the discussion continues, I will be interested to hear what people think of (a) the saturated fat corollary to the low-carb critique, (b) the PCRM argument that meat should have been more fiercely criticized, and (c) the Dietary Guidelines themselves. Throughout the "fruitful rim," where most U.S. fruits and vegetables are produced, the most challenging environmental constraint is not insufficient land but rather insufficient water. Some of the most serious problems are occurring in the Sacramento-San Joaquin River Delta, not far from my home this year in Davis, CA. The region is at risk from both ecological and agricultural disasters in coming years, with an aging network of levees and an environmentally unsustainable system for shifting water from north (where it is more plentiful) to south (where agricultural and urban water deficits are worst). A little further south of the delta, in agricultural regions that have "junior" water rights, I have seen signs along every roadside promoting conspiracy theories about the political origins of the water crisis. [C]rop subsidies can create a disincentive if the subsidy payment is tied to the volume of production. Crop subsidies are now less closely tied to crop acreage and production than in the past, with payments based on past volumes and acreage. However, it is likely that farmers still consider the potential for the loss of subsidies with program adjustments when they make their planting decisions. Changes in federal farm policy are needed to break this link and facilitate more efficient use of water. The report's authors are Ellen Hanak, Jay Lund, Ariel Dinar, Brian Gray, Richard Howitt, Jeffrey Mount, Peter Moyle, and Barton “Buzz” Thompson.